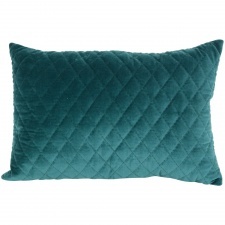 Quilted Cotton Velvet & Chambray cushion in Peacock Green by Grand Illusions. These gorgeous quilted cushions are so luxurious with natural chambray backs and a zip fastening. Complete with luxury feather pad.